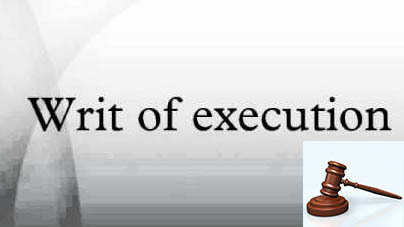 A writ of execution includes a writ of delivery, a writ of seizure and sale as well as a writ of possession. The writ of delivery is used to recover movable property or to assess its value; this is used when a judgment or order for the delivery of that particular movable property or the payment of the assessed value to the judgment creditor has not been followed through. The writ of delivery may include some provisions so that it will enforce the payment of any money adjudged or either they have been ordered by the judgment to be paid or the order which have been enforced by the writ itself. The other writ which is the most common execution if compared to the rest of the writs can be enforced if the judgment or the order for the payment of the money that is not a judgment or order for the payment of the money into the court that has not been followed through yet. An example of such a judgment is the judgment of a debtor’s vehicle where the judgment of the creditor is able to confirm that the judgment debtor is the owner of that particular vehicle. If so then an application can be made for the writ of seizure and sale of their vehicle. The writ of seizures and sale can also be enforced against the judgment debtor’s properties which can also include their residence. If the judgments of the debtor’s properties are subjected to the prior claims such as leasing or from that of financial institution for a great amount, then it may not be justified so that it can proceed with the writ of seizure and sale. This is because the amount from the realization may not be able to cover the actual costs which may include the commission fees as well as the expenses for the execution or even the amount that has been charged to the financial institution. Writ of possession can be enforced with judgment that has been made by the court especially id the previous order or judgment for the giving the possession of that particular immovable property has not been complied with yet. If you are experiencing problems with the execution the judgment then you can put in an application for the Writ of Execution using Form 82. According to the Subordinate Court Rules 1980, Order 31, Rule 2, a writ of execution can be sued to enforce a judgment or order, however it can only be used with the leave of court except the following which includes cases where 6 or more years have lapses since the date when the order or the judgment was made, if the judgment or the order is made against the assets of a deceased person where it has been passed into the hands of their executors or administrators after the date which the judgment or order has been made and there is still interest in issuing the execution against those particular assets, if the movable property that is being sought to be seized under the writ execution is in the hands of the receiver that has been appointed by the courts, if there has been any changes which includes death or otherwise where the parties are entitled or liable to execution under the order or judgment, and where under the judgment or order of any person that has been entitled to a relief subject in order to fulfill any conditions which have been alleged to be fulfilled. If the courts has already grant leave for the issue of the writ of the execution and that particular writ has not been issued within one month after the date in which there has been order to grant such a leave, then that particular order shall cease to have any affect without prejudice. If this happens then a fresh order shall be granted. The leave can be made by notice using Form 81 (Notice for leave to Issue Execution) that is also supported by an affidavit. Are there any properties or items that cannot be seized using the writ of execution? There are properties or items that cannot be seized even if then other party files for the writ of execution. There exist a series of limitation that will provide assistance to a debtor so that they are able to protect sufficient funds in order to provide them with the ‘necessities of life’. According to the Debtor’s Act 1957, the following shall not be liable to seizure or sale in the execution of the writ of seizure and sale, which includes clothing and other apparels, cooking utensils, beds or bedding of the judgment debtor, their wife and children, the tools that they will use in their trade that amounts to RM200.00, which to the extent shall be protected form the writ of execution. Other items that will be protected will include the tools of artisans or if the judgment debtor is an agriculturalist and his possession such as seed-grain and cattle or other similar items that would be vital for their livelihood. This would also include the homes and other buildings that belong to the agriculturalist and those that are occupied by him and finally the account books.